There are a few truths in life that are universally acknowledged. And increasingly the maxim that one shouldn't write Sebastian Vettel off in a qualifying session is threatening to join them. Today's pole position was one that, by rights, shouldn't have been Seb's. The McLarens appeared to have the legs of him, especially Lewis Hamilton who was mighty as usual around the Abu Dhabi track in the qualifying hour, and didn't appear to do an awful lot wrong in his final runs. But what came next was classic Seb: he had the cool head to run significantly after the others on a clear track, put his Red Bull on a knife edge, didn't put a wheel out of place, and snatched the pole from McLaren's jaws by a tenth and a half at the very last of a gripping qualifying crescendo. Vettel's run of poles may seem a bit samey to some, but it's surely impossible not to appreciate watching the master at work on a Saturday. He has that Ayrton Senna-esque ability to find tenths that aren't really there, and also like Senna, he's undoubtedly the driver of the age you'd choose every time to complete a qualifying lap to save your life. 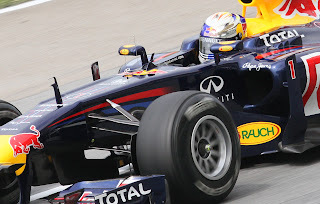 Try to remember the last time Seb made an error in a vital qualifying run and it's very very difficult - brushing the wall in Singapore in 2010, well over a year ago, is that last I could think of. I also couldn't think of many before that. And another record tumbled before Vettel today (an occurrence that seems to happen in every race weekend lately): he equalled Nigel Mansell's record of 14 pole positions in a season, set in 1992. Admittedly, Mansell achieved this in two races fewer (there were 16 races in 1992 as opposed to the 18 so far this year), but it nevertheless underlines the extent that qualifying has been Seb's personal fiefdom in 2011. The two McLaren pilots, having qualified second and third, both after qualifying had the expression of one who'd had their pocket picked, and in a certain sense they had. The one flip side of Seb's stellar lap was that it deprived Lewis of the ultimate reward for his own distinguished performance today. He always goes well at Abu Dhabi, the low grip track and 90-degree corners suiting his driving style, and he continued his recent rehabilitation here, looking just like the Lewis Hamilton of old. It's clear that the McLaren is still a fundamentally quick car around this circuit, but it can't be denied that losing the pole to Vettel has handed him a significant advantage, and greatly diminished the possibility of the McLarens spoiling Vettel's day tomorrow. This is especially given the Red Bull's longer runs, and associated tyre wear rates, have looked relatively strong compared with McLarens on the evidence of practice here. Elsewhere, there is a lot of as you were. 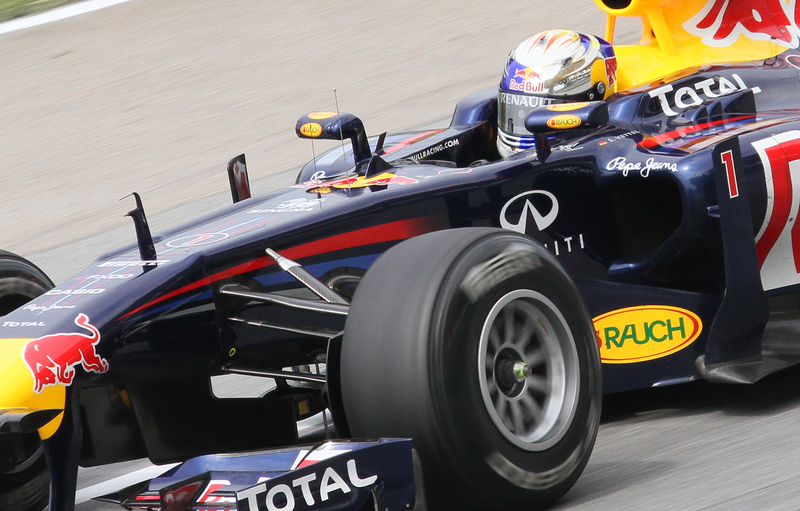 Mark Webber continues to be a bit breathless behind his team mate's pace, and ended up fourth on the grid almost fourth tenths shy, and looked rather bemused by it all subsequently. Then we have the Ferraris, not really near the Bulls and McLarens but clear of the chasing pack, and Alonso ahead of Massa by six tenths. They usually go better, relatively speaking, on a Sunday, so it'll be interesting to see how much they can bridge the gap. Then it's the Mercs, Rosberg once again the preponderant on a Saturday of those two. And kudos to Force India, who continued their good recent form on the tight tracks by completing the top ten on the grid, giving them a boost in their battle for sixth in the constructors championship. This is especially the case as Toro Rosso, who have been coming up on the blind side in recent rounds, will only line up in P13 and P15. And final, sombre, word to Williams. They'll line up last and second last on the grid tomorrow, after Maldonado had to take a grid penalty for using over his engine allocation for the season, and Barrichello couldn't set a qualifying time after an oil leak. This, I am assured, is the team's worst qualifying performance since the 1975 US Grand Prix at Watkins Glen (when neither car started). Much is to change in that team for next season, perhaps necessarily, and after this things can only get better surely. One crumb of comfort for them is that I'm old enough to remember the 1995 European Grand Prix at the Nurburgring, wherein the two McLarens no less toured around off the back of the pack for much of the race. Two years later they had the fastest car out there, so no one knows what lays ahead. No such worries for Seb for now though. Not for the first time in 2011, Seb's prodigy on a Saturday has put him in the box seat for a Sunday.